Aid agencies and the Philippine government are rushing to salvage the wood from some 15 million coconut trees that Typhoon Haiyan struck down in November 2013, but processing the tree debris before it rots is proving problematic, said the country’s top coconut authority. “Even with the additional 1,000 chainsaws [that the Philippine Coconut Authority is sending to local governments], even with the help of the private sector and the… [international organizations], it is not enough,” Eucledes Forbes, administrator of the Philippine Coconut Authority (PCA), told IRIN. The generally high humidity in the Philippines is a real threat - the more moisture in the air, the quicker fallen trees rot. The downed coconut “stems”, or tree trunks, are at risk from pest infestation, most likely beetles. “There’s a small window [of opportunity],” said James Abdul, the UN Development Programme (UNDP) area coordinator for Guiuan municipality in Eastern Samar Province, where UNDP will work with the PCA to remove some of the near two million fallen coconut palms. “We can’t talk about livelihoods until the area is cleared,” Abdul told a meeting of the two organizations earlier in January. The PCA says there is at most six months to salvage the timber. Clearing the land of any rotting wood is critical because the pests can attack and kill newly planted seedlings, threatening the next generation of coconut trees. Re-establishing the coconut plantations, which can take more than a decade to cultivate, is vitally important for farmers, who have lost their cash crop. The weather has not been kind to rescue efforts. On 12 January, heavy rain and strong wind from Tropical Depression Agaton caused two landslides in Southern Leyte Province, which had already lost some 27,000 coconut palms to the November super typhoon. 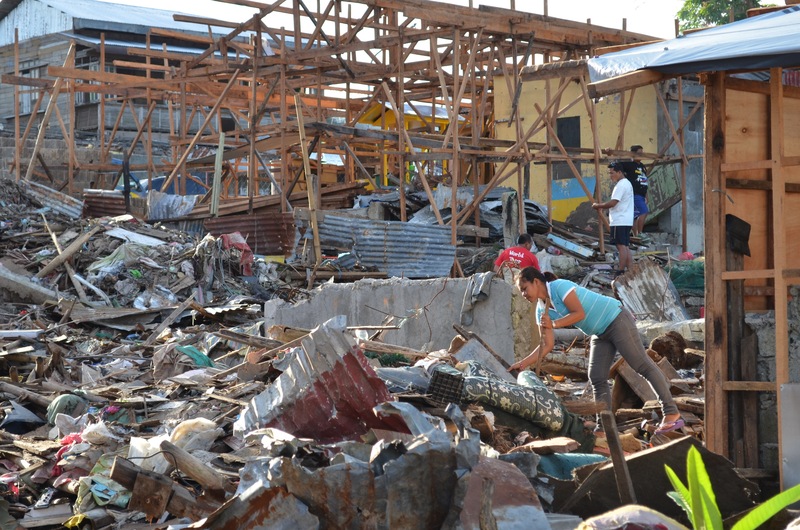 One-third of the tents housing evacuees in the coastal municipality of Guiuan - one of the areas hardest hit by Typhoon Haiyan - were blown over and on 18 January more than 1,000 people were re-evacuated to unoccupied government bunkhouses and privately owned warehouses. The PCA is releasing 1,000 chainsaws to local governments, international aid groups have around 600 - but this is rapidly changing as they receive donated saws or procure more - and some 500 saws are operated by private contractors, a figure based on interviews with private and public millers working on coco-timber. At the rate of 10 trees per chainsaw processed daily, it means some 21,000 trees can be turned into timber every day. But even at this rapid pace it would take nearly two years to just process the 15 million completely damaged palms, and does not take into account the estimated 18 million less damaged ones that may also require processing. Some NGOs are piloting small timber-milling operations. Oxfam provided chainsaws and training to a cooperative of 300 farmers in Palo municipality, Leyte Province, so they could clear their land and mill the fallen palms. The typhoon completely destroyed some 206,000 palms and affected almost 19,000 farmers in the province, according to the PCA. Over the next three months, UNDP plans to employ typhoon survivors in its cash-for-work programme for the removal, processing and storage of timber on the islands of Panay, Samar and Leyte. Up to one-third of the recovered timber will go back to the community to rebuild housing, while the rest will be stored for use by future businesses based on wood-processing, such as charcoal production and composting fertilizer. It could take all of the legally registered chainsaws in the Philippines -7,000 as of mid-January, according to Department of Environment and Natural Resources, which controls chainsaw registration under legislation passed to prevent illegal logging - actively cutting coconuts in affected areas to come near meeting the six-month deadline. At least 10 portable sawmills, which can process coconut logs more quickly than chainsaws and cost anywhere from US$5,000 to $40,000 each, are to be deployed by UNDP and the government to ease the workload. Getting the equipment in place is only the first step. “The challenge is now to train the chainsaw operators. It does not take too long to do that, but we [PCA] do not have enough staff to do it,” said Forbes. There are plans to recruit trainers from chainsaw and sawmill manufacturers. The training is critical due to equipment hazards, he noted. FAO said in a recent technical note on salvaging downed coconuts and trees that any agency providing cutting equipment needs to ensure proper safety equipment and training are also provided. Since mid-December 2013 the International Organization for Migration (IOM) has piloted a housing repair project in Guiuan and Mercedes municipalities in Eastern Samar Province, where it mills and gives coconut timber to households, along with corrugated iron roofing and tools. IOM has distributed nearly 4,000 shelter repair kits, some of which included timber. Albert Spiteri, a consultant working on IOM’s pilot debris-to-shelter project, said finding and training chainsaw operators has been difficult due to an almost 20-year nationwide ban on coconut-logging, which lists as one of its exceptions coconut trees “damaged by typhoon or lightning”. In areas where trees were felled by Typhoon Haiyan, and the 2012 Typhoon Bopha in Mindanao, the PCA is waiving the $22 chainsaw registration fee and the cutting fee of $2.20 per tree. “We hope this will encourage private coconut lumber dealers… This will really help with the clearing,” said Forbes, PCA’s administrator. Once logging starts, the challenge will be to control it. “Loose chainsaws [in the hands of timber poachers] will be a problem,” Ricardo Calderon, director of the forest management bureau in the Department of Environment and Natural Resources, told IRIN in a text message. There is also all the coconut tree debris. Chris Howe, an Australia-based debris management consultant, pointed out that the tree stumps are hard to remove, transport and process. Calderon said the unused parts of a coconut palm, including the stump, could be processed into charcoal, pelletized for use in biofuel production from sugarcane - primarily in Negros Occidental Province - or sold to furniture makers and wood carvers. But under no circumstances can they be burnt, he said, citing the 1990 Clean Air Act, which bans open burning. Coconut wood is considered a “poor man’s lumber”, he said, and it is still unclear how the wood can be treated to extend its life - FAO estimates that once wet, it can last at most four years before pests infest it - or how to store the timber safely. Some proposed treatments include a saltwater soak, chemical treatment, smoking the wood, and air-drying it, but few groups working on coco-timber are systematically treating it. Forbes said there are plans to explore applying green muscardine fungus to the fallen trees as a way to kill beetles.